If you saw the movie Gravity, then you know that space debris can be deadly. Some scientists warn that the crud in Earth's orbit may have reached a dangerous "tipping point." But to prove the point, here's an image from artist Michael Najjar that shows every single piece of real-life junk in our orbit. Has the space junk in Earth orbit really reached a dangerous tipping point? "space debris I" visualizes the collection of defunct objects now in orbit around the earth which includes everything from spent rocket stages and old satellites to fragments from disintegration, erosion, and collisions. 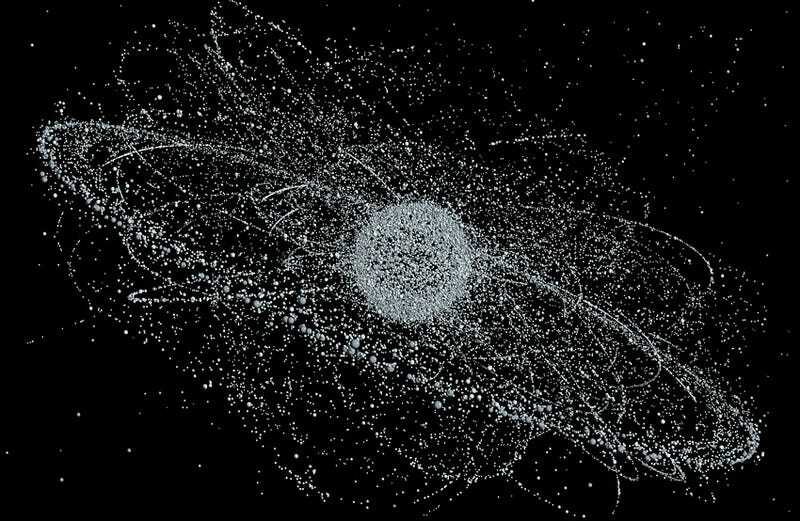 There are now about 600,000 objects larger than 1 cm in orbit circulating at a speed of approximately 28,000 km an hour and posing a serious threat to satellites, space stations and operational spaceflights. Drawn from a data archive, each spherule in the picture represents a real object orbiting in space. The visualization was realized in collaboration with the Institute of Aerospace Systems – TU Braunschweig Germany, the world's leading authority on the tracking of space debris.